Metallic Inks give catalogs an intriguing shimmer that sparks interest from across a room or inside a mailbox. Metallic inks are made with tiny metallic flecks that reflect light and give off a brilliant sheen. Because metallic ink costs less than foil stamping, it's an affordable way to make any catalog shine. Use gold and silver inks to create a traditional look that says luxury. Use colored metallic inks to make seasonal catalogs feel festive. Metallic orange says "Halloween," while shiny red is just right for Valentine's Day. Use bright colors like blue and purple to attract attention and let everyone know that your catalog is something out of the ordinary. 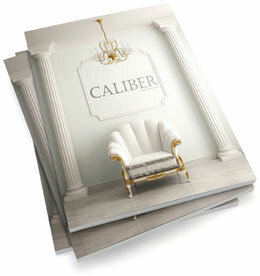 Metallic ink adds glittering accents to catalogs, but it's better for some paper stocks than others. Metallic ink works best on glossy coated stock, so it's a good choice for catalog covers. An additional aqueous coating will protect the ink and keep the metallic particles in place. When designing a catalog, always think in multiples of four pages. Each printed sheet will be folded in half to create four catalog pages - two on the front and two on the back. Our minimum catalog size is four pages, but we can print up to 64. Our standard rectangular catalogs are bound along the long side of the catalog, but we can create a distinctive look by putting the binding on the shorter side instead. 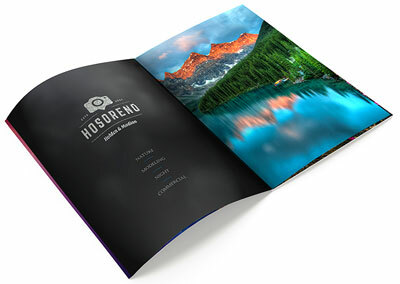 When designing catalogs, use high quality photos to establish your company's image and help readers connect emotionally. Show your product in use - diamonds on the fingers of a happy bride, or your energy drink in the hands of a victorious runner. Colored metallic inks can enhance the mood. Clearly give catalog readers the next steps to doing business with you, and offer them a reason to act now. Put your phone number and web address on every page, and highlight it with metallic ink on the back cover. Use metallic ink to showcase a special discount for ordering soon. And use promotional codes so you can track your catalog's effectiveness. Include QR codes and social media links to give your catalog readers multiple ways to interact with you. Metallic inks are ideal ways to call attention to your company name and logo, but there are plenty of other ways to use metallic ink in catalog printing. Make a bold statement with just a few words of metallic text on a plain background. Highlight bullet points with metallic ink. Or use metallic ink over an image of something that actually is made of metal. Metallic inks lend themselves to creativity, and they can be combined to produce all sorts of special effects. Not sure how to do that? Our designers can help you make something special. Metallic inks are an easy and affordable way to elevate a plain catalog to something that demands attention. Include great photos and special offers and your catalog is sure to be a success. Have questions about using metallic inks on catalogs?